It was a normal working day back in March 2010 when my mobile rang about mid-morning. �This is the Shooting Times; do you remember entering a competition back in October to do with Chudleys dog food?� I said that I vaguely remember entering it. 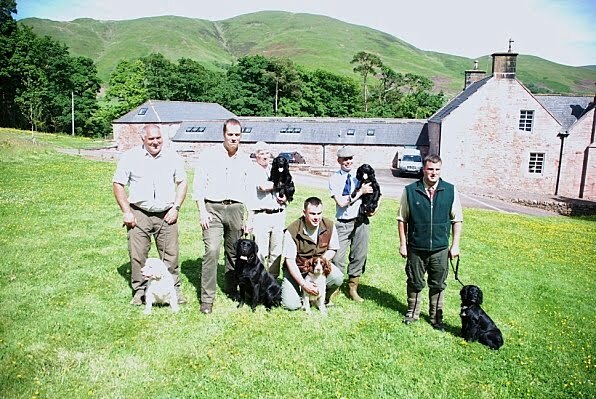 �Well you are one of the lucky five winners, are you available on the 18/19 of June as the prize is two days dog training with David Lisett at Buccleuch Kennels in Scotland. Along with accommodation for two, and 6 months� worth of dog food�. There could only be one answer to this question no matter what I was doing on these dates. The weeks seemed to pass by very quickly and I was soon on my way up the motorway to Scotland. We arrived in the early afternoon of Thursday 17 June at our accommodation Gillbank House in the middle of Thornhill. The next morning at breakfast a table had been set up for all the winners. This was a good ice breaker for people to get to know each other before moving off to the Buccleuch Kennels. We all arrived at the Kennels at 0845hrs and were met by David Lisett, Ian & Debbie Major from Chudleys along with a reporter and photographer from the Shooting Times. Having all been introduced to everyone we moved off to the kennels. David asked each of us what dog we had with us and what stage we were at with its training. He also asked what we hoped to get out of the two days. David having got a good idea of the standard of the people and their dogs, he then went on to explain the training equipment he used. 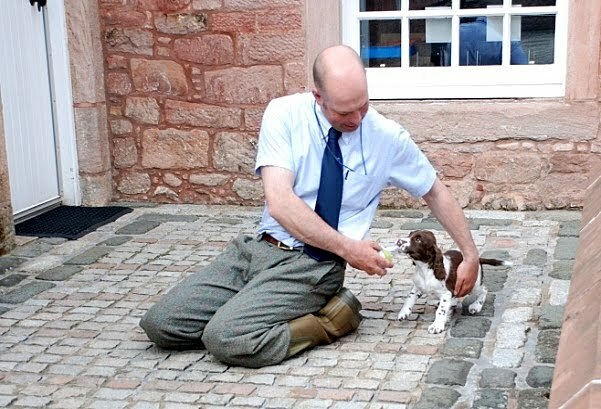 We moved out to the courtyard and David got out an 8 week old Labrador and Springer which had not started any training yet. He spent the next 15-20 minutes just throwing a knotted handkerchief around on the ground and encouraging the dog to come back with the handkerchief. After a short time he changed the handkerchief for a tennis ball and by just encouraging the puppy to return and raising his voice to get the puppies attention when it was not coming back, David had both puppies delivering the ball to hand in no time at all. This was a fantastic show of David’s ability to train young dogs as neither puppy had had any training up to this time in its life. 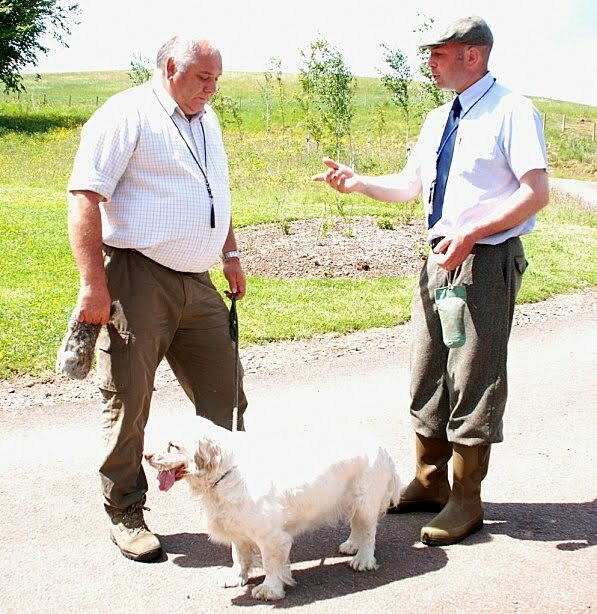 We moved off to a training area outside the kennels where each of us had to show David what we could do with our dogs. After each person had been through with their dog David explained to each person his ways of doing some of the exercises that we had put our dogs through and ways to correct mistakes that our dogs or we had made. This was the last exercise we did and brought what had been a fantastic morning to an end. After lunch we talked about our experiences with other trainers that we had come across and the way they had gone about some of the exercises we had done in the morning. We could all see by this time that David’s methodology into dog training was completely different to anything we had come across before. We moved back to the training area where David used some of his own dogs to go through setting up your exercises using the training area you had available to you. What you should be looking for in each exercise? 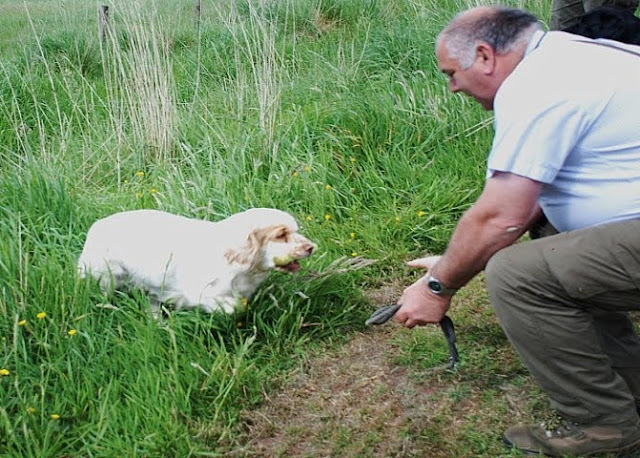 Make sure that you are not going to confuse the dog about what it has to do by making sure that if possible there are obstacles either side of the area where you are going to do a retrieve so that the dog will come straight back to you. 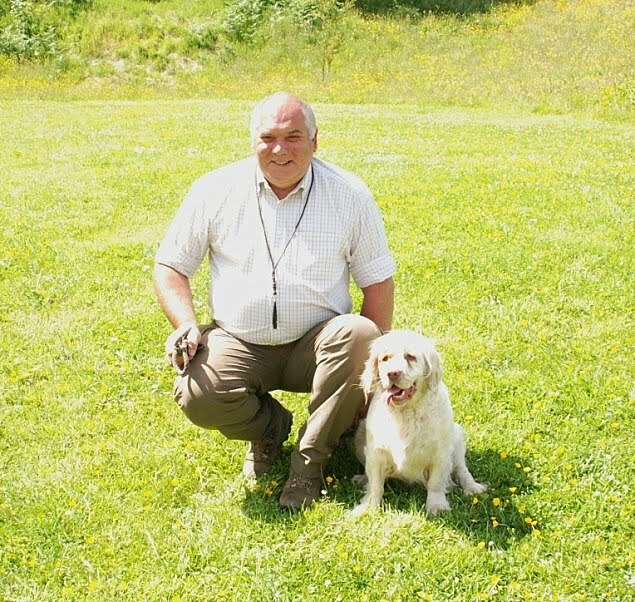 In David�s opinion a retrieve should be looked on as a reward for the dog and you cannot have a situation where you are doing to many retrieves. David’s methodology to correcting mistakes was one that I had not been told about before by other trainers. You should not be heavy handed with the dog, but to get the dog�s attention by raising your voice and returning the dog back to you then run through the exercise again. This time when it is carried out correctly ensure that the dog gets lots of praise when it has carried it out right. David also explained that the way in which you carry out the exercise with your manner and tone of voice will make a big difference to the result. If you have had a bad day and you are tense, this can be transmitted to the dog and the dog will not carry out the exercise correctly. The first day came to an end with all of us having seen and learnt so much in one day it was hard to take it all in. We spent a few minutes planning the next day with David and all agreed that we were so looking forward to it. We all agreed the night before that we would all like to start the day with dealing with obstacles. We moved off to another training area near the kennels which had ditches, fences and stone walls to work with. David explained how to set up your training exercise and how to build up the training in stages. A number of dogs had never completed training like this as these types of obstacles are not available to people in the area in which they live. Brie had had no experience of obstacles before coming to this training so we started with a small stone wall with a ditch the other side and a steep bank up the far side. Within 20 minutes David and I had her jumping the wall and retrieving a dummy from the top of the bank on the far side. After lunch we moved out to the lake in front of Drumlanrig Castle to go through water work. There were two dogs that had not done much water work of which Brie was one. David started by making sure that the dummy that was to be used by the dogs would be retrieved. 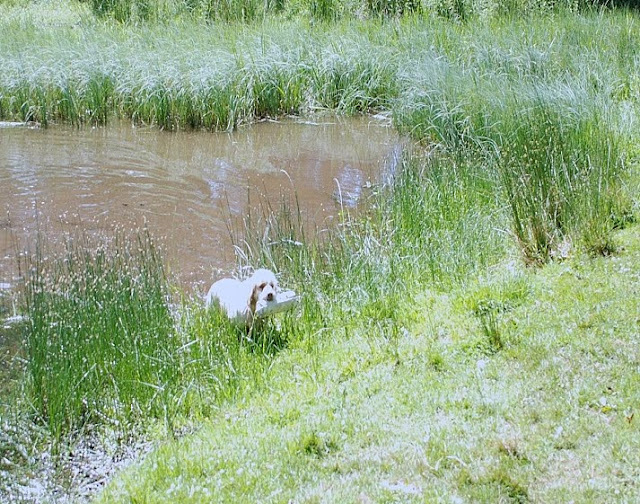 He then built up the exercise by starting at the water�s edge then moved into the reeds in the water and finally right out into the lake. Within 20 minutes Brie was carrying out a blind retrieve from over 50 meters out on the lake. We then moved to an area on the lake where David had set up a dummy launcher for some of the more advanced dogs. This exercise was to send the dummy across the lake which was 100 metres wide into a fenced compound that was full of cover and trees. David built up the exercise slowly by first sending the dummy half way across the lake, then onto the far bank and finally into the compound. Again after just 20 minutes of training the more advanced dogs were retrieving the dummy from the compound having swum the lake, jumped the fence and found the dummy and then returned across the lake and delivering the dummy to the handler. Having completed the water exercises we again moved off to another training area on the estate which had been set up to carry out long technical retrieves. This area not only had a number of different types of fences. It also had ditches, banks and small quarry workings along with a large amount of different types of cover to contend with. We spent the rest of the afternoon working on the different types of fences to do retrieving over. At the end of the day we returned to the Kennels and had time to look round them as they had not long been upgraded at a cost of 1 million pounds. We spent the last bit of the day looking back over the two days training and discussed any points we wanted to with David. He then went through with each of us the points that he felt we should be working on with our dogs. 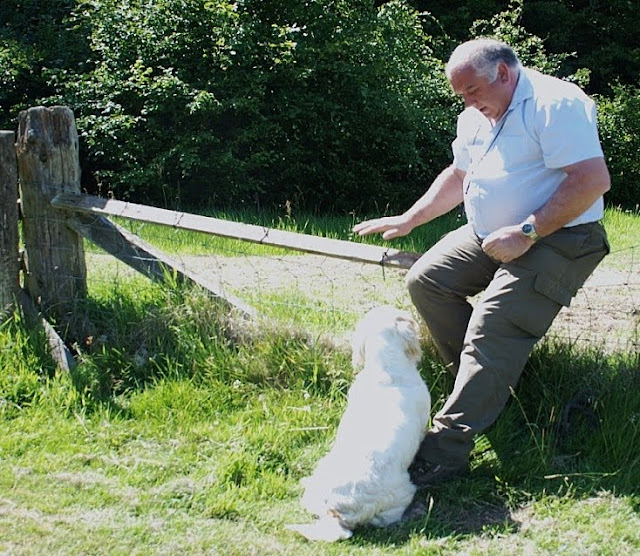 David had not had that much experience of training with a working Clumber Spaniel but after the two days he did say that he was impressed with what Brie could do and how quickly she picked up new training. We all thanked David for what was a fantastic two days training in a way that all of us had not come across before. We not only thanked David for his time but also Chudleys for setting up the competition for this training.